In December 2015, after years of negotiations, 197 countries made a commitment to work together to address climate change. The Paris Climate Agreement came into force on November 4, 2016, and is seen as a turning point for global climate policy and the ability for international cooperation to safeguard the planet. Despite this unprecedented international unity to tackle a global threat, in June 2017, the White House announced that the United States would withdraw from the accord. 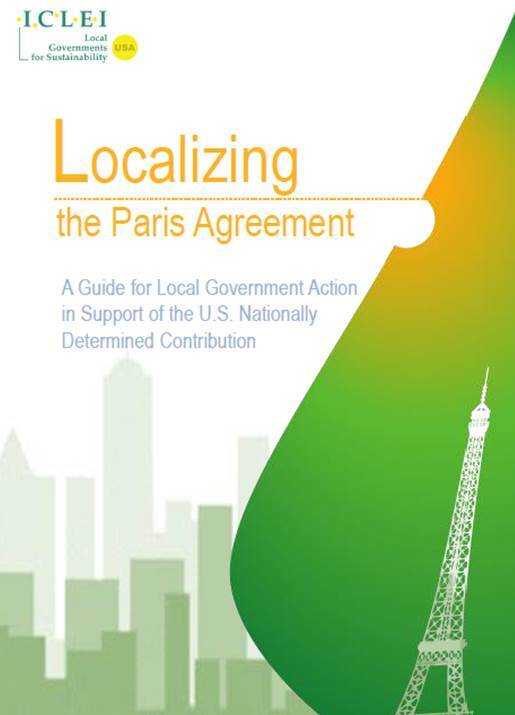 Although the federal government also has walked away from domestic climate action by eliminating the U.S. State Department’s Special Envoy for Climate Change position and by choosing to disband NOAA’s advisory committee on climate change, the outpouring of support for Paris by thousands of mayors, county officials, and city council members — through campaigns such as We Are Still In, Global Covenant of Mayors for Climate & Energy, and U.S. Climate Mayors — shows that local governments have not. Download the full guide [PDF]. This entry was posted in CityTalk USA, News Center, Resources and tagged climate action, Paris Agreement. Bookmark the permalink.